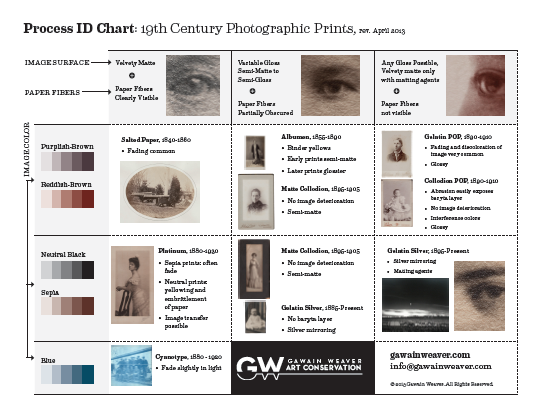 We will be releasing the first version of our new 19th Century Photographic Print Process ID chart in the near future. The link for a PDF version of the chart will go out via our newsletter as soon as we have finalized the design. You can sign-up here for the newsletter. Process ID charts dealing with other categories of photographic materials such as photomechanical, digital, and color will be released as they are ready. There have been many process ID charts made over the past few decades. Some have attempted to be comprehensive, others have focused on a particular time period. Perhaps the most well-used has been James Reilly's process ID chart for 19th century photographic prints, which was included in his 1986 publication "Care and Identification of 19th-Century Photographic Prints". This book is still in print and can be purchased directly from the Image Permanence Institute. This new series of charts that we are creating at Gawain Weaver Art Conservation are focused around the needs of Care and ID workshop attendees. While this first chart shares some of the basic features of Reilly's chart it attempts to further break down the decision-making flow by the color of the image. It has been used with workshop students in various versions over the past two years and has been very useful in the workshop setting. Please send any feedback as you use the chart to info@gawainweaver.com, we would love to hear from you! And be sure to sign up for the newsletter so you can receive a higher resolution PDF when it is made available. This backprint chronology of Kodak color prints from 1942 to the present is part of a larger on-going research project into the understanding and technical analysis of chromogenic color photography. We are making this portion available now, as it can be very useful on its own for the dating of color prints. Visit the library to download.